The Twins FX are special effects consultants who work in the special fx industry covering theatrical magic and illusion, magic effects, and special effects animatronics. Special effects for pantomimes and theatre illusion work include many performances using The Twins FX ‘flying without wires system’ such as Dr Who Live with a levitating Dalek, Alladin on his flying carpet and even a real R22 helicopter that takes off, hovers on stage, then flies out into the theatre without wires! The theatre special effects create amazing and unique viewing performances for the audience. 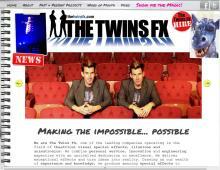 The Twins FX have extensive knowledge and experience in providing magical special effects and magical illusions. The illusion designer offers bespoke illusions created to customers specific requirements offering almost everything you can imagination. The Twins FX have an extensive supply of special effects props and special effects for hire. Bill The Croc - a lifelike crocodile 4 metres long and 3 metres high that can lip sync and snap his jaws. Norman the Giant - he's 12 metres tall when standing, can lip sync and is a little scarey! Little Earnie - a silverback Gorilla who's 7 metres tall and can lift a person into the air. Sid the Dragon - a fire breathing, animatronic dragon.